GÉRONTE, father to Léandre and Hyacintha. Léandre, son to Géronte, and lover to Zerbinette. Oct. To a daughter of Mr. Géronte? Oct. My father is just returning with Mr. Géronte, and they want to marry me. 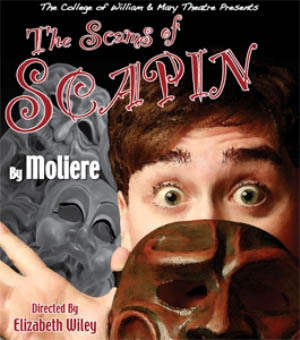 Oct. You know, Scapin, that two months ago Mr. Géronte and my father set out together on a voyage, about a certain business in which they are both interested. Oct. And that both Léandre and I were left by our respective fathers, I under the management of Silvestre, and Léandre under your management. Oct. Some time afterwards Léandre met with a young gipsy girl, with whom he fell in love. Oct. Curiosity made me urge Léandre to come in with me. We went into a low room, where we saw an old woman dying, and with her a servant who was uttering lamentations, and a young girl dissolved in tears, the most beautiful, the most touching sight that you ever saw. Oct. After a few words, with which I tried to soothe her grief, we left her; and when I asked Léandre what he thought of her, he answered coldly that she was rather pretty! I was wounded to find how unfeelingly he spoke to me of her, and I would not tell him the effect her beauty had had on my heart. Sil. Now, add to this the unforeseen return of the father, who was not to be back before two whole months; the discovery which the uncle has made of the marriage; and that other marriage projected between him and a daughter which Mr. Géronte had by a second wife, whom, they say, he married at Tarentum. Hya. Ah! Octave, is what Silvestre has just told Nérine really true? Is your father back, and is he bent upon marrying you? Sca. 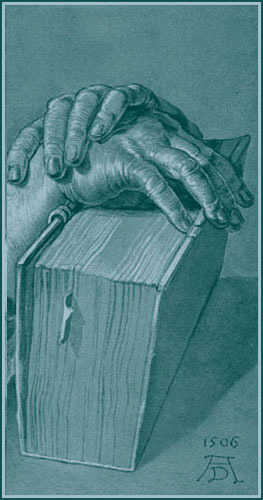 I have sworn with many oaths never more to meddle with anything. But if you both entreat me very much, I might…. Sca. That will do. Now, fancy that I am your father, just arrived; answer me boldly as if it were he himself.—"What! you scoundrel, you good-for-nothing fellow, you infamous rascal, unworthy son of such a father as I, dare you appear before me after what you have done, and after the infamous trick you have played me during my absence? Is this, you rascal, the reward of all my care? Is this the fruit of all my devotion? Is this the respect due to me? Is this the respect you retain for me? "—Now then, now then.—"You are insolent enough, scoundrel, to go and engage yourself without the consent of your father, and contract a clandestine marriage! Answer me, you villain! Answer me. Let me hear your fine reasons"….—Why, the deuce, you seem quite lost. Sca. Do you expect him to be as wise as you are? Can you put an old head on young shoulders, and expect young people to have all the prudence necessary to do nothing but what is reasonable? Just look at our Léandre, who, in spite of all my lessons, has done even worse than that. I should like to know whether you yourself were not young once, and have not played as many pranks as others? I have heard say that you were a sad fellow in your time, that you played the gallant among the most gallant of those days, and that you never gave in until you had gained your point. Arg. No, I am not kind-hearted; I can be angry when I choose. Leave off talking; you put me out of all patience. (To Silvestre) Go, you rascal, run and fetch my son, while I go to Mr. Géronte and tell him of my misfortune. Sca. Leave it to me; the plan is all ready. I am only puzzling my brains to find out a fellow to act along with us, in order to play a personage I want. But let me see; just look at me a little. Stick your cap rather rakishly on one side. Put on a furious look. Put your hand on your side. Walk about like a king on the stage.1 That will do. Follow me. I possess some means of changing your face and voice. Arg. I mean, Mr. Géronte, that we should never be so ready to blame the conduct of others, and that those who live in glass houses should not throw stones. Lea. Allow me to embrace you, and…. Lea. (drawing his sword). You are setting me at defiance, I believe.… Ah! I will teach you how…. Oct. (stepping between them). Ah! Léandre. Sca. (to Léandre). Eh! Sir. Oct. (keeping back Léandre). For mercy's sake! Oct. In the name of our friendship, Léandre, do not strike him. Oct. (still keeping back Léandre). Gently, gently. Oct. (keeping back Léandre). Léandre! Oct. (keeping back Léandre). Gently. Sca. Yes, Sir; it is true that three weeks ago, when you sent me in the evening to take a small watch to the gypsy3 girl you love, and I came back, my clothes spattered with mud and my face covered with blood, I told you that I had been attacked by robbers who had beaten me soundly and had stolen the watch from me. It is true that I told a lie. It was I who kept the watch, Sir. Oct. (stepping between them). Ah! I beg…. 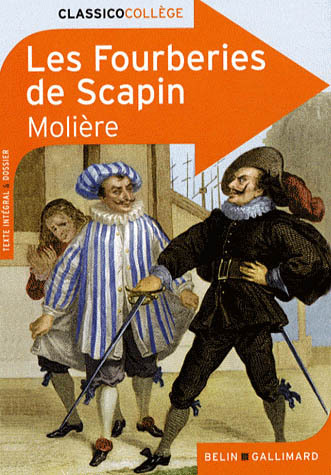 SCENE VI.—LÉANDRE, OCTAVE, CARLE, SCAPIN. Sca. (rising and passing proudly before Léandre). Ah! my dear Scapin! 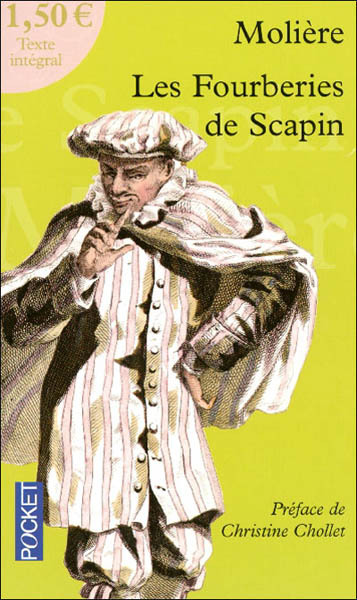 I am my dear Scapin, now that I am wanted. Sca. I must extract this money from your respective fathers' pockets. (To Octave) As far as yours is concerned, my plan is all ready. 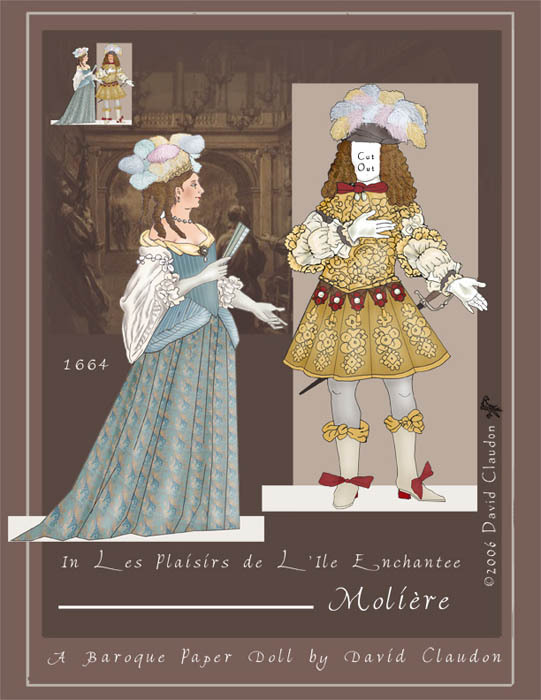 (To Léandre) And as for yours, although he is the greatest miser imaginable, we shall find it easier still; for you know that he is not blessed with too much intellect, and I look upon him as a man who will believe anything. This cannot offend you; there is not a suspicion of a resemblance between him and you; and you know what the world thinks, that he is your father only in name. Sca. Just what I told him. I laughed his proposal to scorn, and made him understand that you were not a man to be duped in that fashion, and of whom anyone can ask five or six hundred pistoles! However, after much talking, this is what we decided upon. "The time is now come," he said, "when I must go and rejoin the army. I am buying my equipments, and the want of money I am in forces me to listen to what you propose. I must have a horse, and I cannot obtain one at all fit for the service under sixty pistoles." Sca. "I must also have," he said, "a mule to carry…." Sca. Don't go and expose yourself to…. Sca. But to go to law you need money. You must have money for the summons, you must have money for the rolls, for prosecution, attorney's introduction, solicitor's advice, evidence, and his days in court. You must have money for the consultations and pleadings of the counsel, for the right of withdrawing the briefs, and for engrossed copies of the documents. You must have money for the reports of the substitutes, for the court fees4 at the conclusion, for registrar's enrolment, drawing up of deeds, sentences, decrees, rolls, signings, and clerks' despatches; letting alone all the presents you will have to make. Give this money to the man, and there you are well out of the whole thing. Sil. Blood and thunder! It is all I ask, all I ask. (Drawing his sword.) Ah! s'death! ah! s'blood! Why can I not meet him at this very moment, with all these relations and friends of his? If he would only appear before me, surrounded by a score of them! Why do they not fall upon me, arms in hand? (Standing upon his guard.) What! you villains! you dare to attack me? Now, s'death! Kill and slay! (He lunges out on all sides; as if he were fighting many people at once.) No quarter; lay on. Thrust. Firm. Again. Eye and foot. Ah! knaves! ah! rascals! ah! you shall have a taste of it. I'll give you your fill. Come on, you rabble! come on. That's what you want, you there. You shall have your fill of it, I say. Stick to it, you brutes; stick to it. Now, then, parry; now, then, you. (Turning towards Argante and Scapin.) Parry this; parry. You draw back? Stand firm, man! S'death! What! Never flinch, I say. Sca. (affecting not to see Géronte). O Heaven! O unforeseen misfortune! O unfortunate father! Poor Géronte, what will you do? Sca. Can no one tell me whereto find Mr. Géronte? Sca. (running about on the stage, and still affecting not to see or hear Géronte). Where could I meet him, to tell him of this misfortune? Ger. You say that he asks…. Sca. (to Léandre), But I could do nothing for you. Sca. I am sure I don't know, Sir; it is an unpleasant business. I tremble for you from head to foot and…. Wait a moment. Sca. Wait a minute. I have just thought, at the proper moment, of the very thing to save you. You must get into this sack, and I…. Sca. Hide yourself; here comes one of the bullies! He is looking for you. (Altering his voice. )8 "Vat! I shall not hab de pleasure to kill dis Géronte, and one vill not in sharity show me vere is he?" (To Géronte, in his ordinary tone) Do not stir. "Pardi! I vill find him if he lied in de mittle ob de eart." (To Géronte, in his natural tone) Do not show yourself. "Ho! you man vid a sack!" Sir! "I will give thee a pound if thou vilt tell me where dis Géronte is." You are looking for Mr. Géronte? "Yes, dat I am." And on what business, Sir? "For vat pusiness?" Yes. "I vill, pardi! trash him vid one stick to dead." Oh! Sir, people like him are not thrashed with sticks, and he is not a man to be treated so. "Vat! dis fob of a Géronte, dis prute, dis cat." Mr. Géronte, Sir, is neither a fop, a brute, nor a cad; and you ought, if you please, to speak differently. "Vat! you speak so mighty vit me?" I am defending, as I ought, an honourable man who is maligned. "Are you one friend of dis Géronte?" Yes, Sir, I am. "Ah, ah! You are one friend of him, dat is goot luck!" 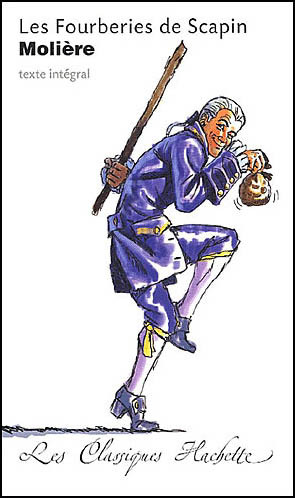 (Beating the sack several times with the stick.) "Here is vat I give you for him." (Calling out as if he received the beating) Ah! ah! ah! ah! Sir. Ah! ah! Sir, gently! Ah! pray. Ah! ah! ah! "Dere, bear him dat from me. Goot-pye." Ah! the wretch. Ah!…ah! Ger. You should have gone a little farther back, then, to spare me, and…. Sca. (pushing Géronte's head back into the sack). Take care, here is another man who looks like a foreigner. "Frient, me run like one Dutchman, and me not fint all de tay dis treatful Géronte." Hide yourself well. "Tell me, you, Sir gentleman, if you please, know you not vere is dis Géronte, vat me look for?" No, Sir, I do not know where Géronte is. "Tell me, trutful, me not vant much vit him. Only to gife him one tosen plows vid a stick, and two or tree runs vid a swort tro' his shest." I assure you, Sir, I do not know where he is. "It seems me I see sometink shake in dat sack." Excuse me, Sir. "I pe shure dere is sometink or oder in dat sack." Not at all, Sir. "Me should like to gife one plow of de swort in dat sack." Ah! Sir, beware, pray you, of doing so. "Put, show me ten vat to be dere?" Gently, Sir. "Why chently?" You have nothing to do with what I am carrying. "And I, put I vill see." You shall not see. "Ah! vat trifling." It is some clothes of mine. "Show me tem, I tell you." I will not. "You vill not?" No. "I make you feel this shtick upon de sholders." I don't care. "Ah! you vill poast!" (Striking the sack, and calling out as if he were beaten) Oh! oh! oh! Oh! Sir. Oh! oh! "Goot-bye, dat is one littel lesson teach you to speak so insolent." Ah! plague the crazy jabberer! Oh! Sca. (pushing his head back into the bag). Take care; I see half a dozen soldiers coming together. (Imitating the voices of several people.) "Now, we must discover Géronte; let us look everywhere carefully. We must spare no trouble, scour the town, and not forget one single spot Let us search on all sides. Which way shall we go? Let us go that way. No, this. On the left. On the right. No; yes." (To Géronte in his ordinary voice) Hide yourself well. "Ah! here is his servant. I say, you rascal, you must tell us where your master is. Speak. Be quick. At once. Make haste. Now." Ah! gentlemen, one moment. (GÉRONTE looks quietly out of the bag, and sees Scapin's trick.) "If you do not tell us at once where your master is, we will shower a rain of blows on your back." I had rather suffer anything than tell you where my master is. "Very well, we will cudgel you soundly." Do as you please. "You want to be beaten, then?" I will never betray my master. "Ah! you will have it—there." Oh! Ger. (alone). Ah! infamous wretch! ah! rascal! ah! scoundrel! It is thus that you murder me? Zer. (laughing, without seeing Géronte). Ah, ah! I must really come and breathe a little. Zer. (not seeing Géronte). Ah, ah, ah, ah! What an amusing story! What a good dupe that old man is! Zer. There is in his name some Ron…Ronte…. Or…Oronte…. No. Gé…Géronte. Yes, Géronte, that's my miser's name. I have it now; it is the old churl I mean. Well, to come back to our story. Our people wished to leave this town to-day, and my lover would have lost me through his lack of money if, in order to wrench some out of his father, he had not made use of a clever servant he has. As for that servant's name, I remember it very well. His name is Scapin. He is a most wonderful man, and deserves the highest praise. ZER. But just listen to the plan he adopted to take in his dupe—ah! ah! ah! ah! I can't think of it without laughing heartily—ah! ah! ah! He went to that old screw—ah! ah! ah!—and told him that while he was walking about the harbour with his son—ah! ah!—they noticed a Turkish galley; that a young Turk had invited them to come in and see it; that he had given them some lunch—ah! ah!—and that, while they were at table, the galley had gone into the open sea; that the Turk had sent him alone back, with the express order to say to him that, unless he sent him five hundred crowns, he would take his son to be a slave in Algiers—ah, ah, ah! You may imagine our miser, our stingy old curmudgeon, in the greatest anguish, struggling between his love for his son and his love for his money. Those five hundred crowns that are asked of him are five hundred dagger-thrusts—ah! ah! ah! ah! He can't bring his mind to tear out, as it were, this sum from his heart, and his anguish makes him think of the most ridiculous means to find money for his son's ransom—ah! ah! ah! He wants to send the police into the open sea after the Turk's galley— ah! ah! ah! He asks his servant to take the place of his son till he has found the money to pay for him—money he has no intention of giving—ah! ah! ah! He yields up, to make the five hundred crowns, three or four old suits which are not worth thirty—ah! ah! ah! The servant shows him each time how absurd is what he proposes, and each reflection of the old fellow is accompanied by an agonising, "But what the deuce did he want to go in that galley for? Ah! cursed galley. Ah! scoundrel of a Turk!" At last, after many hesitations, after having sighed and groaned for a long time…. But it seems to me that my story does not make you laugh; what do you say to it? Ger. What I say? That the young man is a scoundrel—a good-for-nothing fellow—who will be punished by his father for the trick he has played him; that the gypsy girl is a bold, impudent hussy to come and insult a man of honour, who will give her what she deserves for coming here to debauch the sons of good families; and that the servant is an infamous wretch, whom Géronte will take care to have hung before to-morrow is over. SCENE VIII.—ARGANTE, GÉRONTE, NÉRINE, SILVESTRE. Ger. What! you here, Nérine? Ner. (on her knees before Géronte). Ah! Mr. Pandolphe, how…. Ger. Call me Géronte, and do not use the other name any more. The reasons which forced me to take it at Tarentum exist no longer. Sil. I have two things to tell you. One is that Octave is all right; our Hyacintha is, it seems, the daughter of Géronte, and chance has brought to pass what the wisdom of the fathers had decided. The other, that the old men threaten you with the greatest punishments— particularly Mr. Géronte. Sca. Leave that to me. I shall find the means of soothing their anger, and…. SCENE X.—GÉRONTE, ARGANTE, HYACINTHA, ZERBINETTE, NÉRINE, SILVESTRE. SCENE XI.—ARGANTE, GÉRONTE, OCTAVE, HYACINTHA, ZERBINETTE, NÉRINE, SILVESTRE. Arg. Come, my son, come and rejoice with us about the happiness of your marriage. Heaven…. Arg. Yes; but what you do not know…. Arg. I mean to say that the daughter of Mr. Géronte…. Oct. The daughter of Mr. Géronte will never be anything to me. Ger. It is she who…. Oct. (to Géronte). You need not go on, Sir; I hope you will forgive me, but I shall abide by my resolution. Arg. (to Octave). Your wife…. Hya. (showing Géronte). Yes, Octave, this is my father whom I have found again, and all our troubles are over. SCENE XII.–ARGANTE, GÉRONTE, LÉANDRE, OCTAVE, HYACINTHA, ZERBINETTE, NÉRINE, SILVESTRE. SCENE XIII.—ARGANTE, GÉRONTE, LÉANDRE, OCTAVE, HYACINTHA, ZERBINETTE, NÉRINE, SILVESTRE, CARLE. SCENE XIV.—ARGANTE, GÉRONTE, LÉANDRE, OCTAVE, HYACINTHA, ZERBINETTE, NÉRINE. SILVESTRE, CARLE, SCAPIN. Sca. (brought in by some men, his head wrapped up, as if he were wounded). Oh, oh! gentlemen, you see me…. Oh! You see me in a sad state. Oh! I would not die without coming to ask forgiveness of all those I may have offended. Oh! Yes, gentlemen, before I give up the ghost, I beseech you to forgive me all I have done amiss, and particularly Mr. Argante and Mr. Géronte. Oh! Sca. (to Géronte). It is you, Sir, I have offended the most, because of the beating with the cudgel which I…. Sca. I feel in dying an inconceivable grief for the beating which I…. Sca. That unfortunate beating that I gave…. Sca. Alas! how good you are. But is it really with all your heart that you forgive me the beating which I…? Arg. Mr. Géronte, let us forgive him without any condition, for we are all so happy.